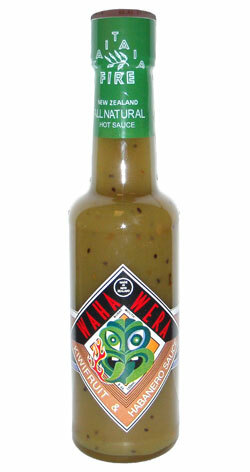 “The Burning Mouth” fuses kiwifruit, manuka honey and certified organic habanero peppers. It won the world’s best Hot Fruit Sauce in 1996, at Chile Peppers Magazine’s Fiery Foods Challenge. Where an inspired genius has blended those peppers with the tang of kiwifruit and the medicinal benefits of manuka honey. And from where you can participate in the spirit that sent those ancient people across vast tracts of ocean.Unsurpassed for marinades, or simply used as a table sauce, Waha Wera will transport you to another place. To gentler, greener pastures where fierce warriors will shriek with laughter at those foolish enough to underestimate the power of the world's hottest peppers. Kiwifruit (55%), Sugar, Water, Habanero Chilies (14%), Manuka Honey, Salt, Food Acids (E260, E270, E331), Spices. I like a hot sauce that packs flavor and heat. A friend in New Zealand sent this, along with Manuka honey, to Texas for my enjoyment. Wow, this is fantastic stuff. A really nice, sweet start followed by the heat. I enjoy making hot sauces, and if I ever get close to the flavor that this brings it will be a success in my book. This is some hot and very flavoursome sauce. very nice indeed. Just got mine in the post after trying some at GBK, it is the bomb. I love hot things and I must say this is the best hot sauce I have ever tried. Goes with pretty much everything, I just finished up a bacon sandwich smothered in the stuff! I discovered this at a gbk and I instantly fell in love. Such a unique sauce that, for me, adds to almost any meal. I first tried this sauce in Goumet Burger Kitchen and fell in love. The sweetness of the fruit and honey is such a massive complement to the hot fiery pepper. I literally cover all my food in it and always have it ready to dip. Goes with anything. But not for the faint hearted. If you don't like burnt mouth, it probably won't be for you. If you do like burnt mouth, then buy this mofo! !